This electronic/groove laden EP is an instrumental offering from DropkicK. A collection of beeps, twitches, samples and glitches mixed with keyboards and saxophones. The end product are 4 songs the stutter and groove along in digital funk-light fashion. The first track is titled "An Ode to Carl" and is the most electro-heavy of the bunch as it mixes in vocals from the youtube clips of "Llama's in Hats" as the aforementioned Carl is the much viewed digital llama. 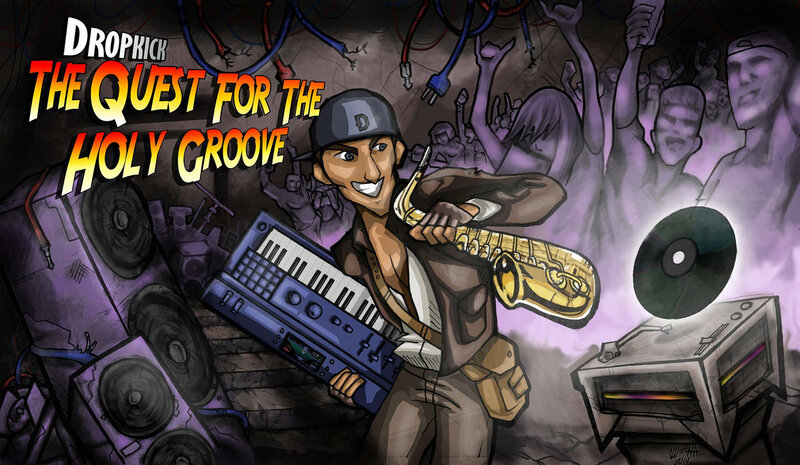 "Setting The Groove" gets the sax revved up and mixes in dynamics from electro dance tracks in the vein of Knife Party. "Coffee and Blues" contains a deep bass break that builds the song up from scratch midway through incorporating harmonica's, sax and electro laser flashes; our favorite track here. Closing out things "Why Hello Miss Tasty" builds around a digital keyboard riff that gets morphed multiple ways throughout the track, almost unrecognizable at times. Overall there is a bit too much space between beats, but catchy rhythms and the saxophone keep things interesting. In the future tighter and deeper grooves (and some drums) may help DropkicK along on their quest for that elusive holy groove.